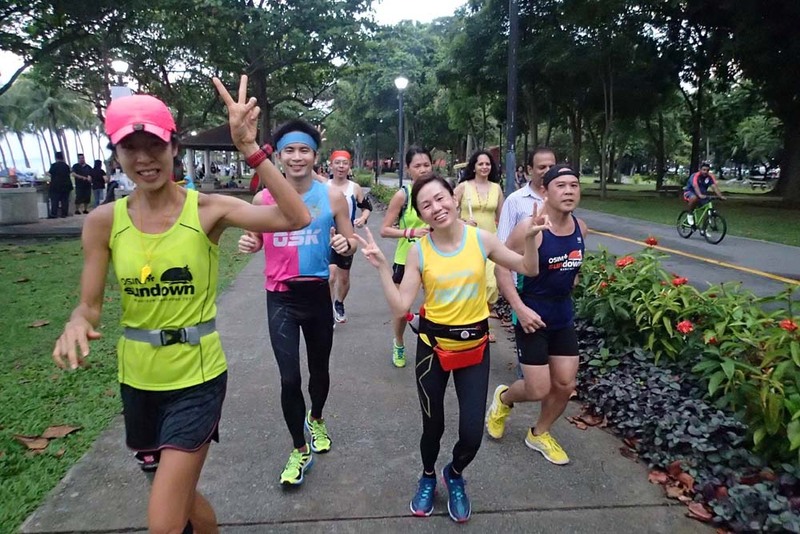 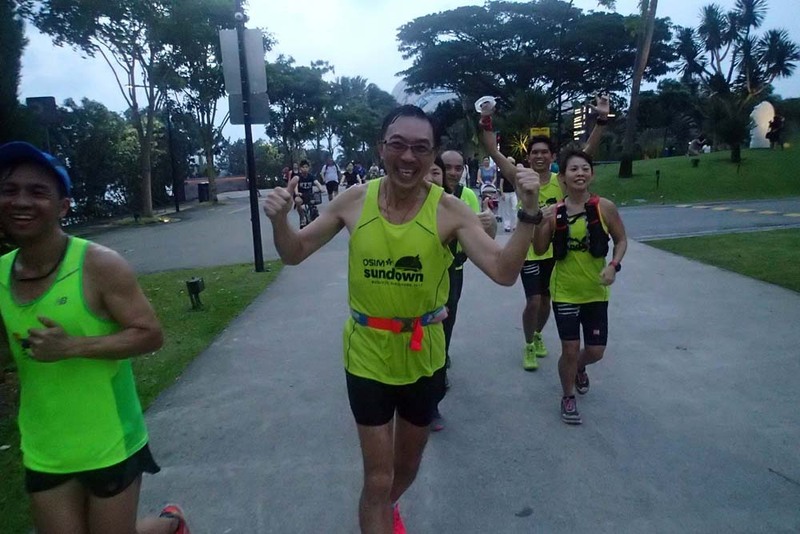 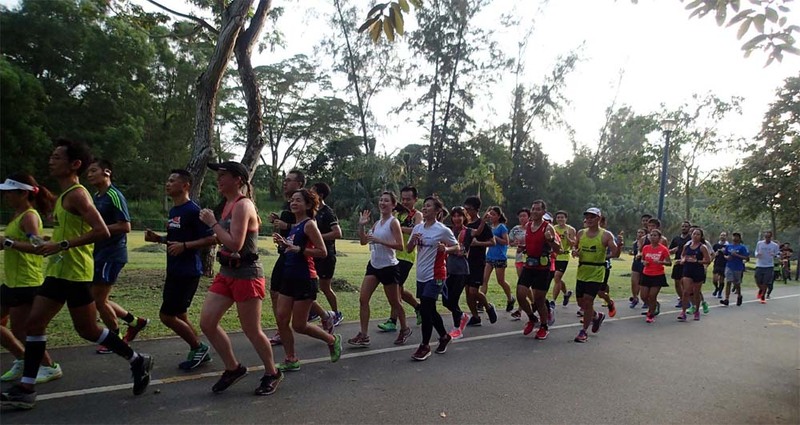 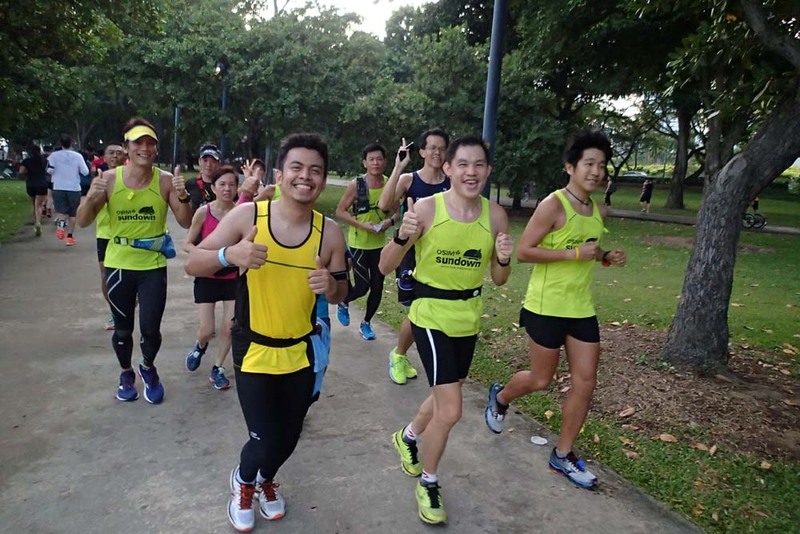 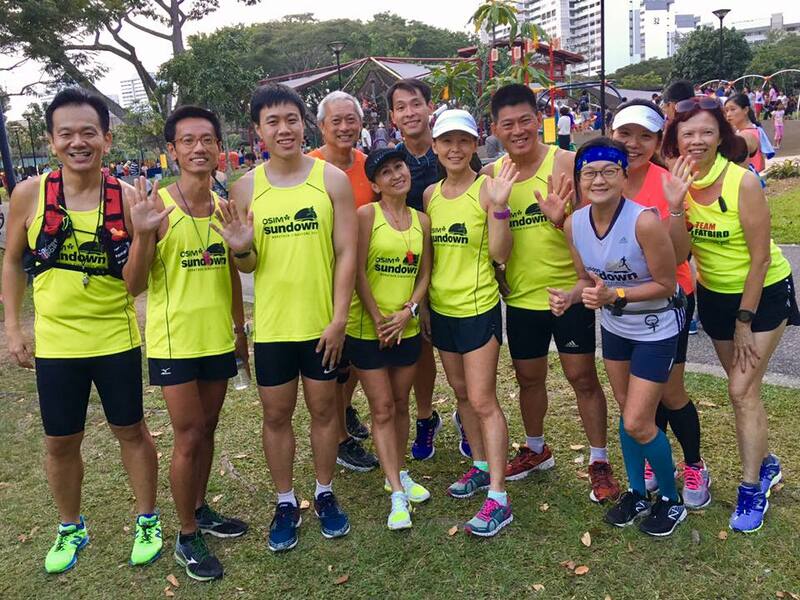 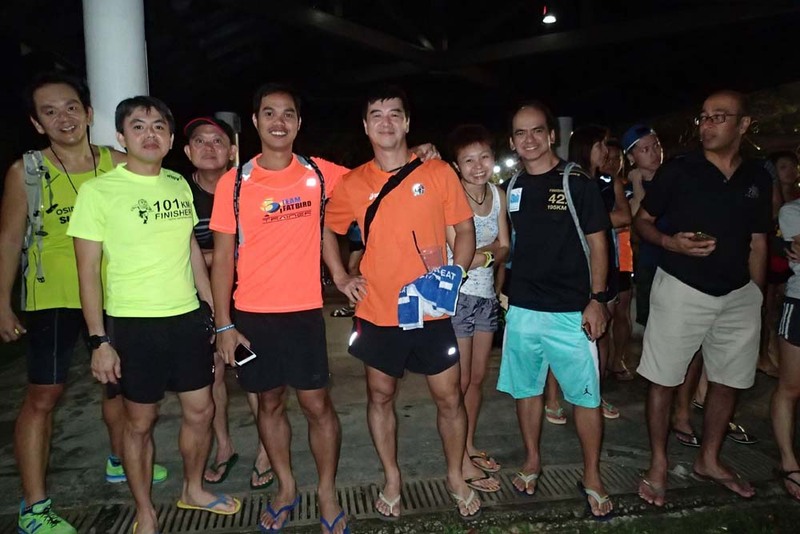 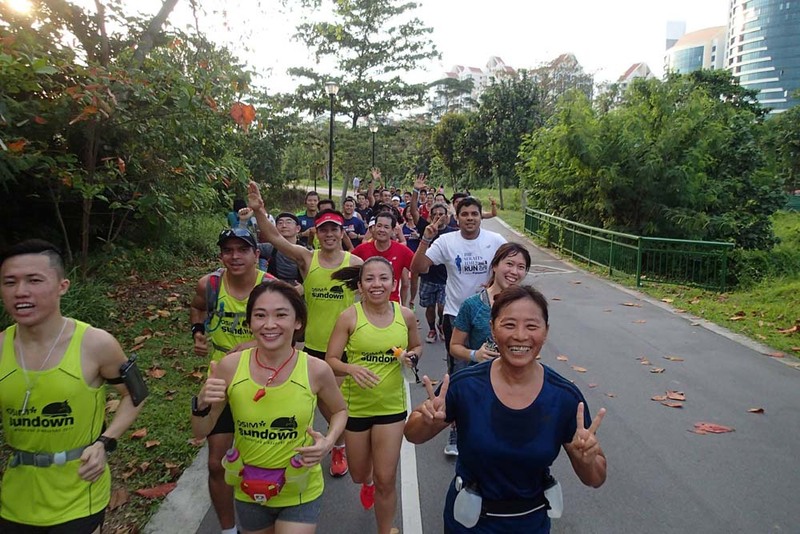 In week #10 of Sundown Marathon Training, the NightHawks and Sundown Marathon Pacers went through their longest run of 32km as part of their progression towards race night. 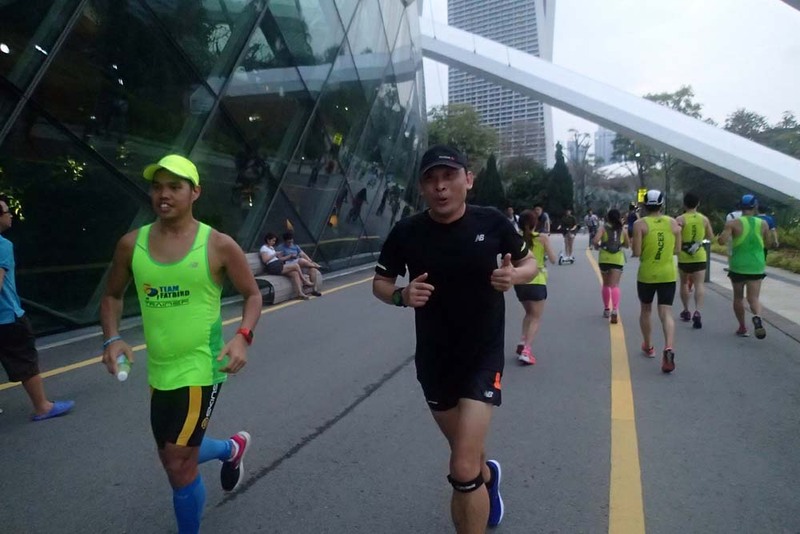 The first half of the run was at Marathon Pace (MP) with the cue for moving into Optimal Pace (7s/km faster) in the second half of the distance to achieve a negative split. 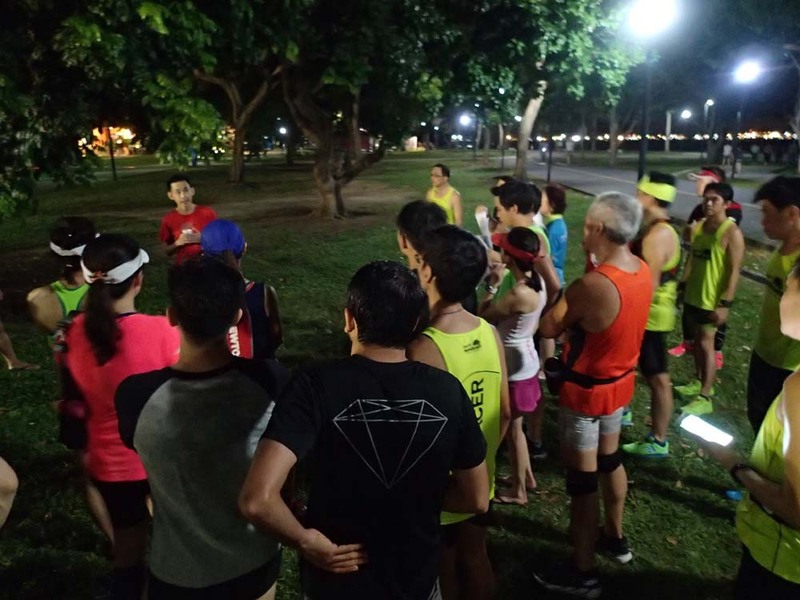 This was conditioning for the faster runners in each pace group to not only sustain MP, but move into a quicker OP to build confidence for race night. 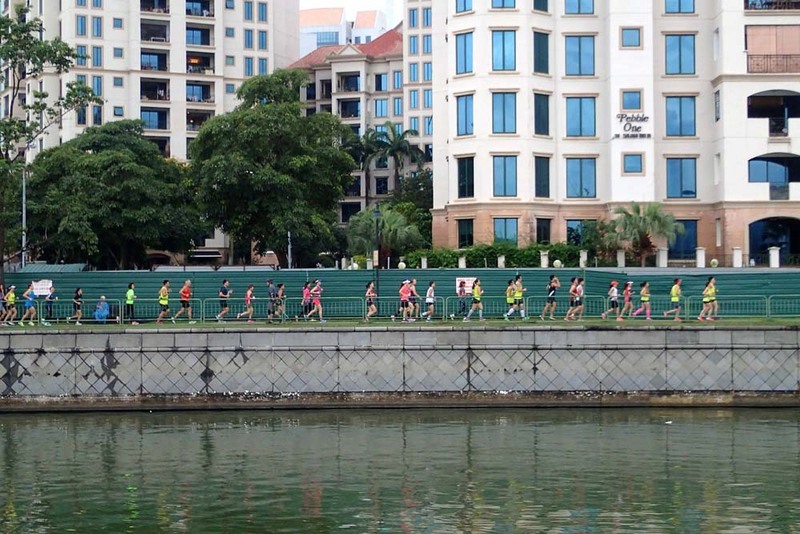 The cool weather after the afternoon bout of showers provided a nice setting for the long run. 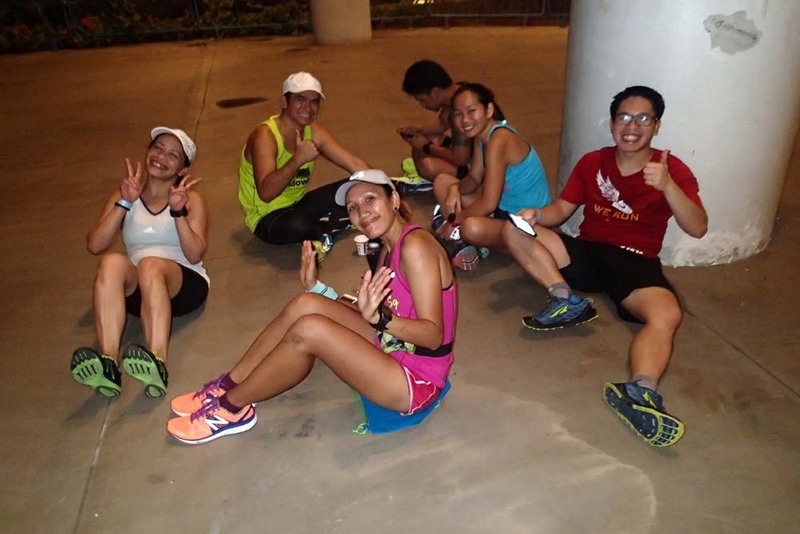 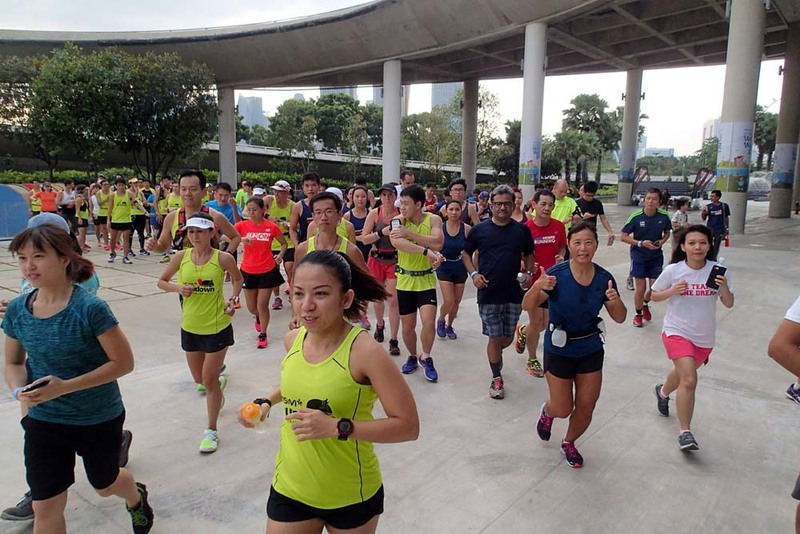 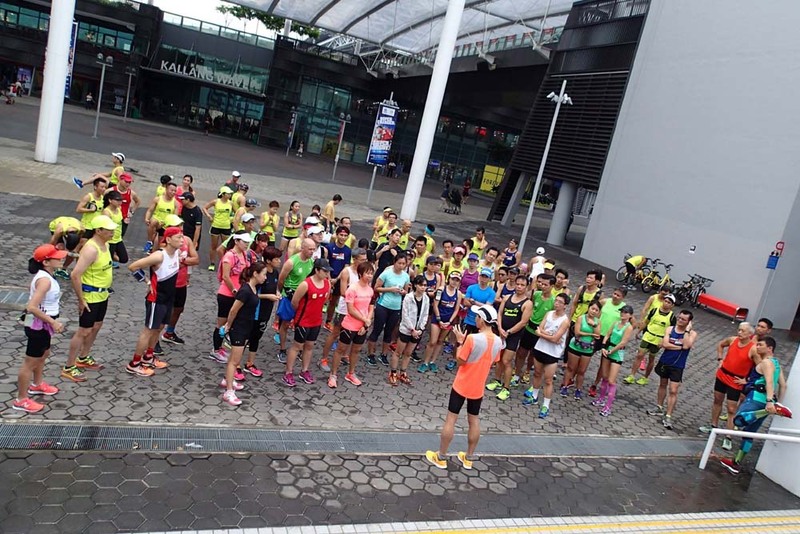 It was choc-a-bloc when we hit the Marina Bay Sands segment, providing some challenges to our running groups trying to meander around the thick crowds. 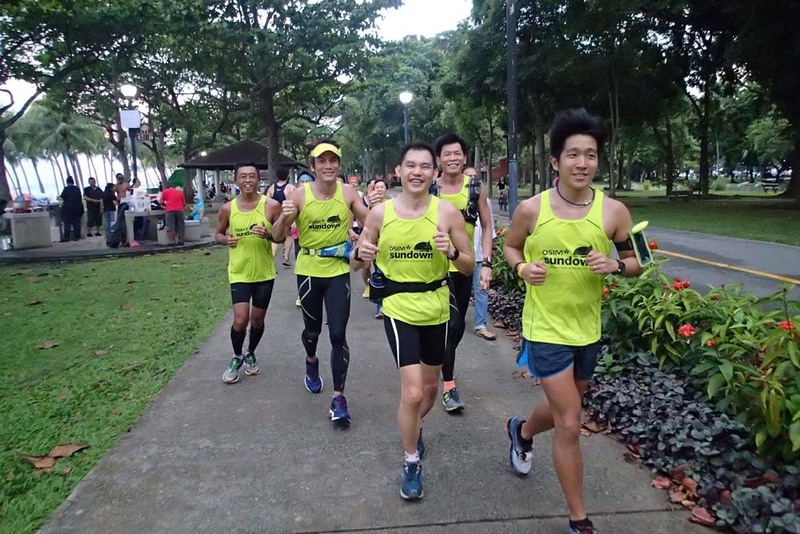 Half of the trainees encountered dropping of pace after 20km of running, and had to pare down the aggressive OP to the more sustainable MP. 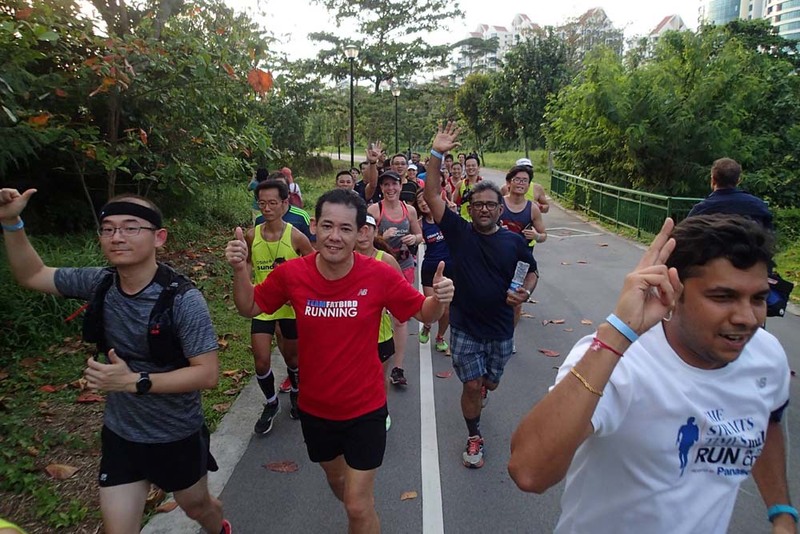 Hydration and Fuel Plans were put to practice by the trainees, which allowed most of them to complete the 28-32km in fine form. 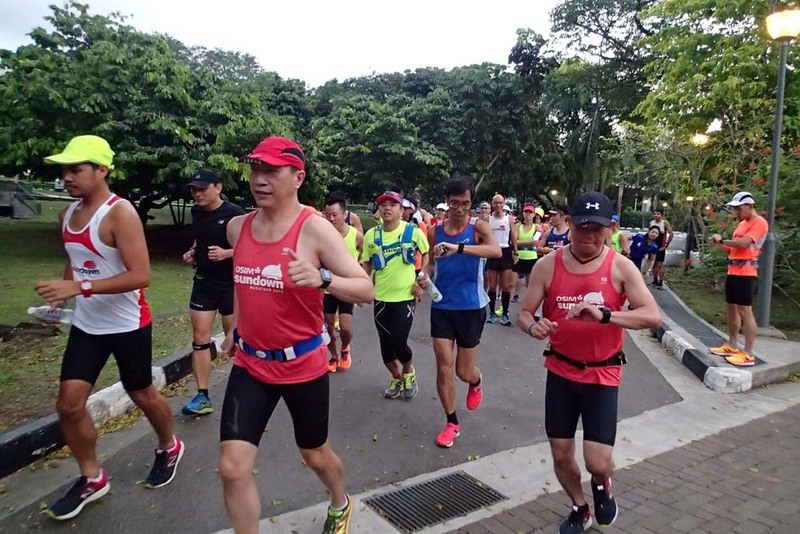 The Half Marathoners had it much better since they have already done 2-3 20km+ training runs at MP, as many completed their training run distance of 20km in target timings. 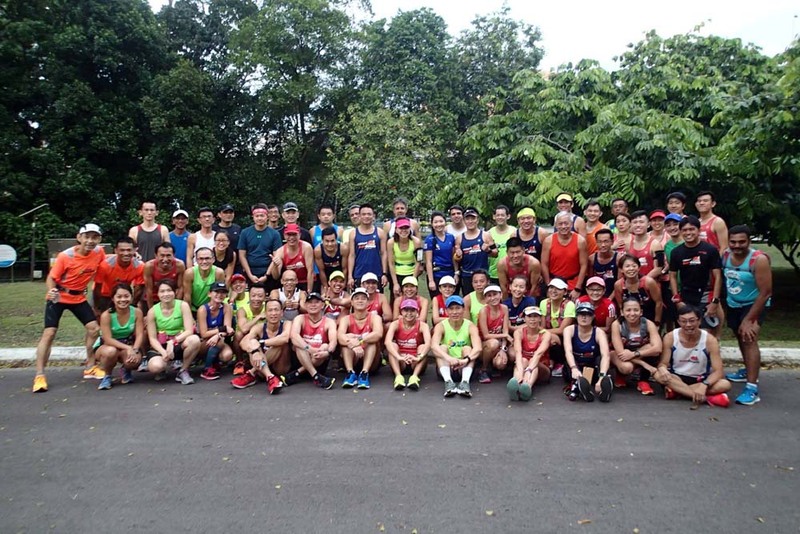 All groups returned by the 230min maximum time-on-feet exposure, with many trainees gaining confidence after having completed 2-3 30km+ training runs so far. 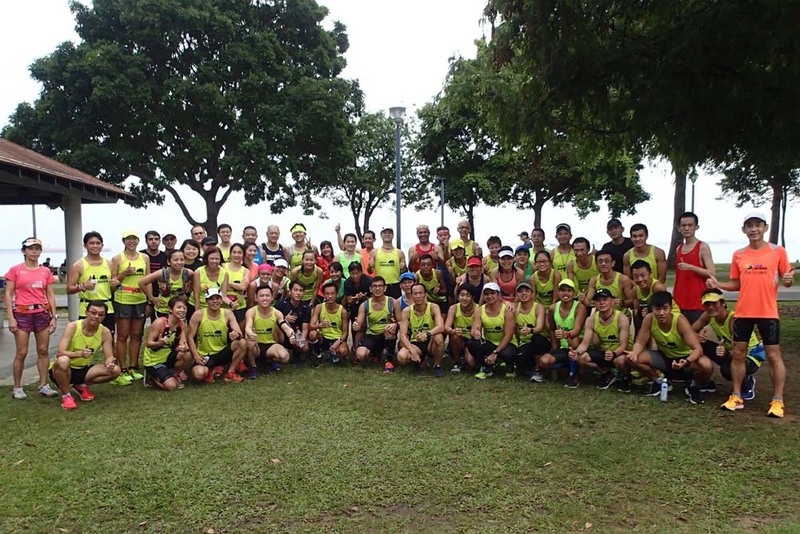 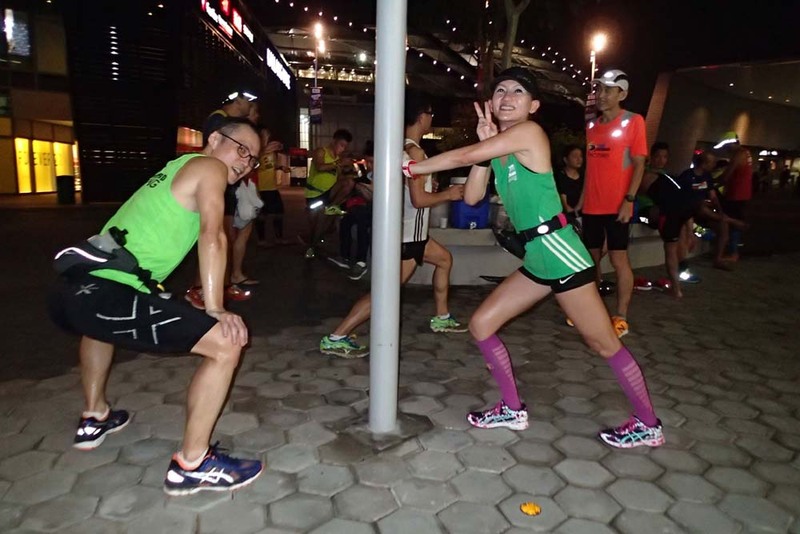 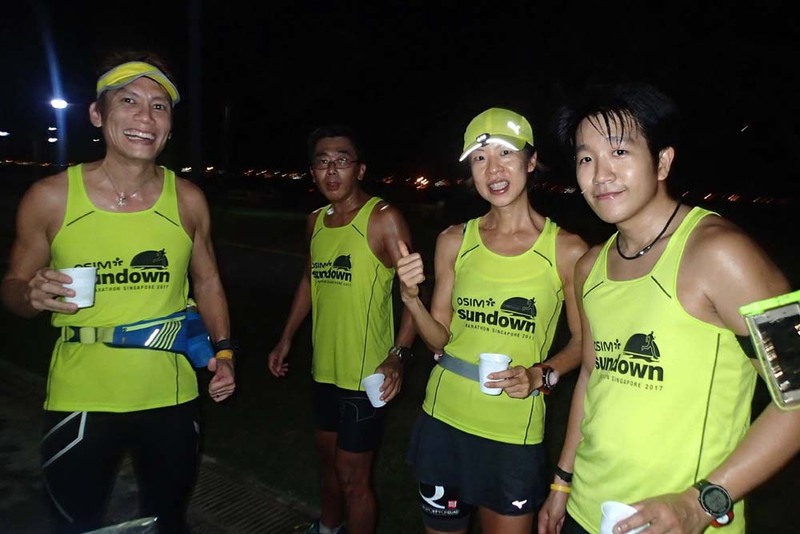 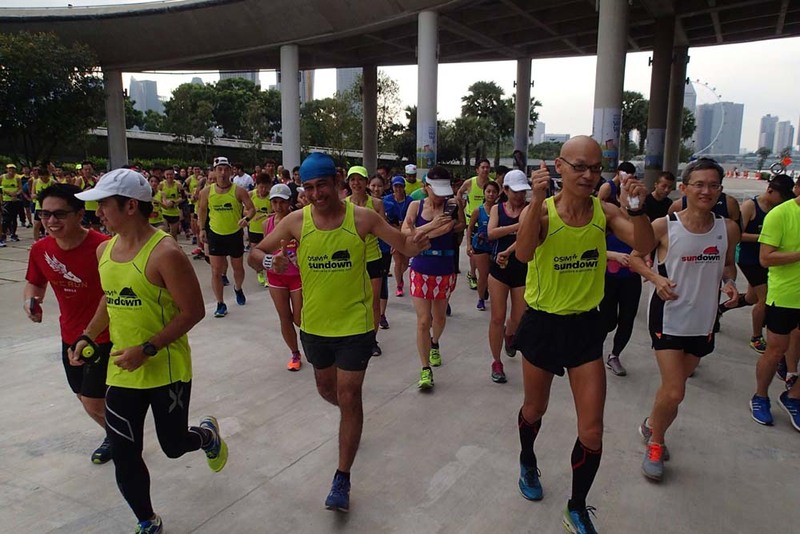 The NightHawks will now look forward to the Tapering Phase, starting next weekend, with the final Sundown lead up run at Marina Barrage. 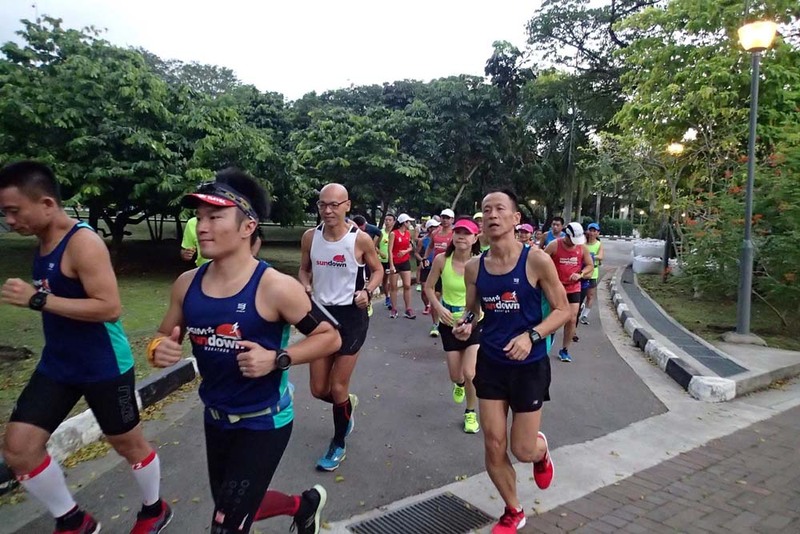 Although their mileage will be reduced, their training intensities remain for all the remaining long runs and weekday tempo and hills workouts. 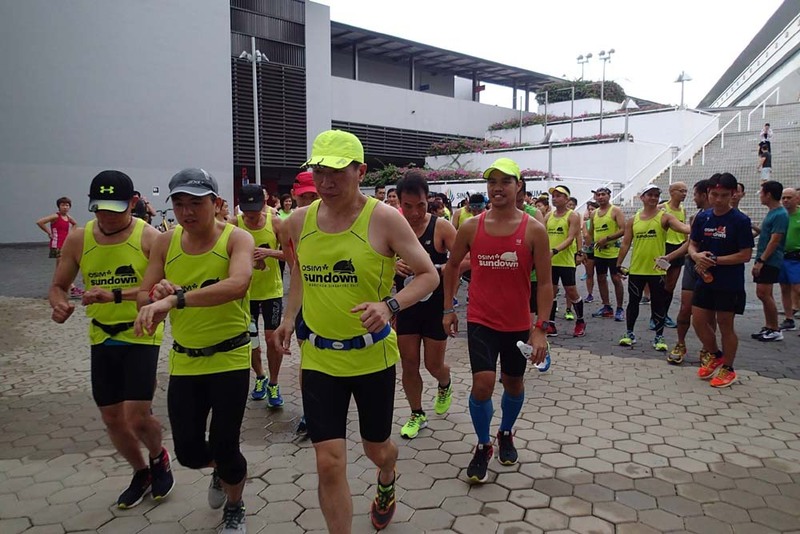 Because of the heavy downpour the whole afternoon, the Sundown Marathon Lead Up Run was called off by the Sundown Organizer as the rain didn’t look like it would stop in time. 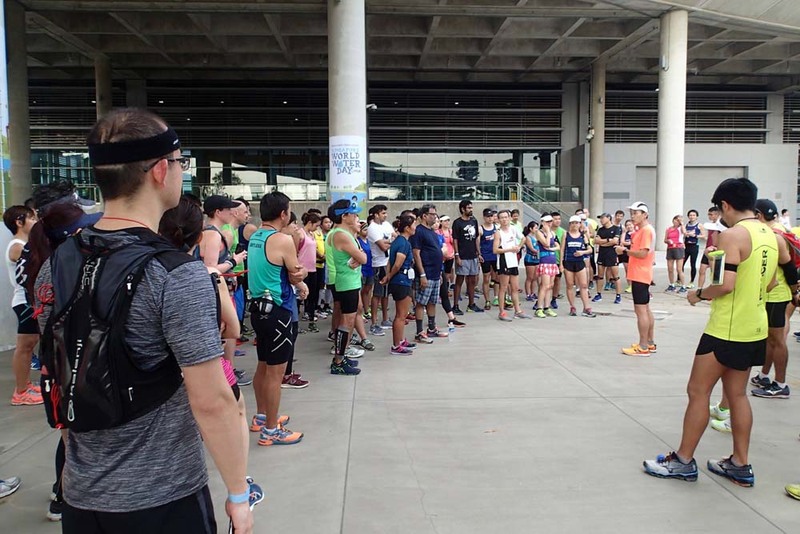 The Pacers along with a handful of runners who showed up decided to do our own training run when the rain stopped by 5pm. 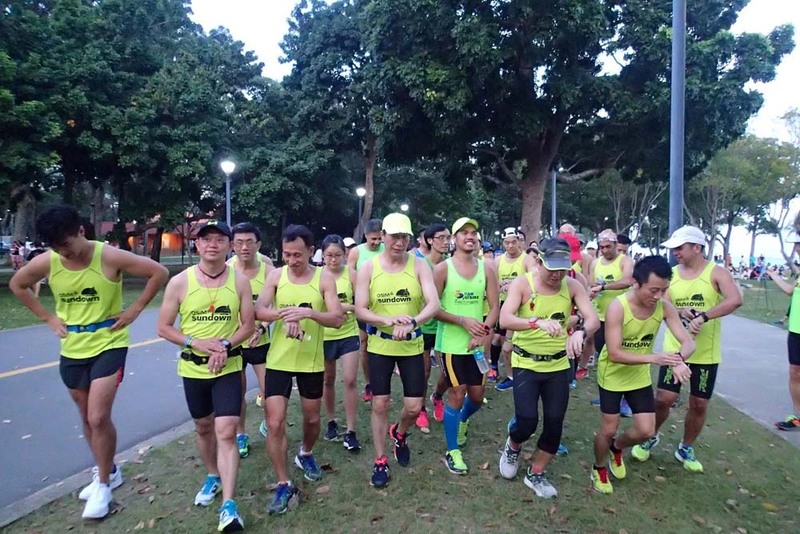 The weather was cool after the showers, and the enthusiastic Sundown Pacers don on their bright coloured singlets to test out their Marathon Pace for 19km (Half Marathon Pacers) and 30km (Full Marathon Pacers). 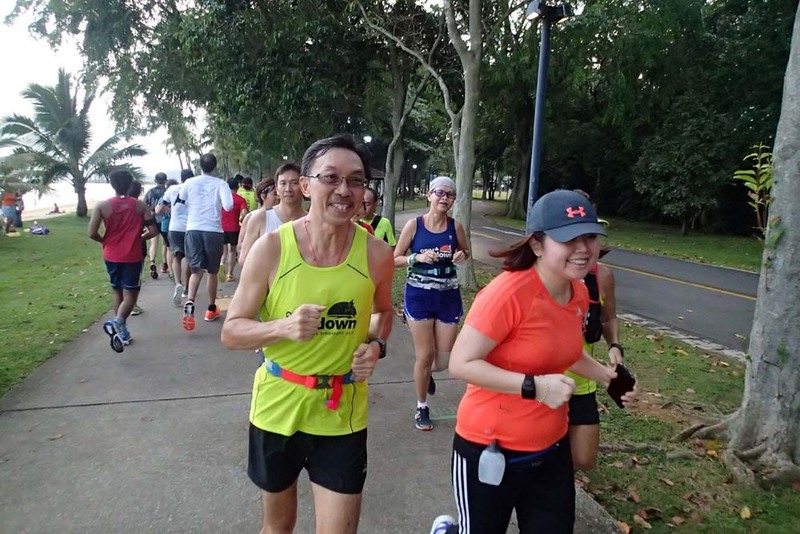 The route was quite clear all along the way to ECP, possibly due to the cancellation/postponement of activities and the Marina Run 5km and 10km due to bad weather. 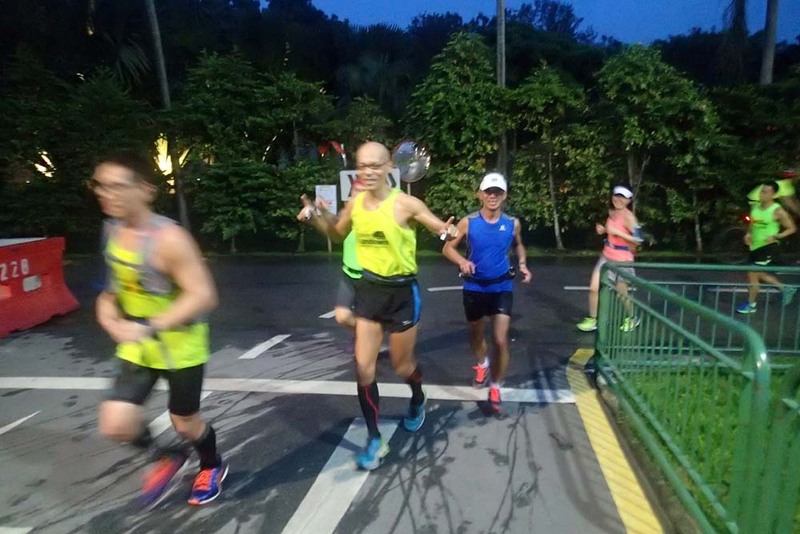 In spite of not having the lead up runners, the Pacers took their training and target pacing seriously as they would have to produce the same results on race night. 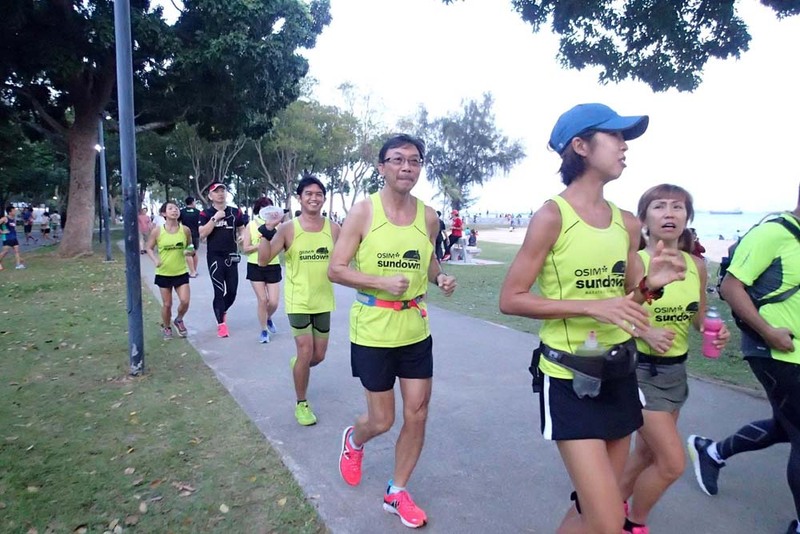 The first half of their respective distances to just before the Cable Ski (HM) and NSRCC (FM) was ran with steady target paces as the cool winds blew towards the runners moving as unified entities in their respective pace groupings. 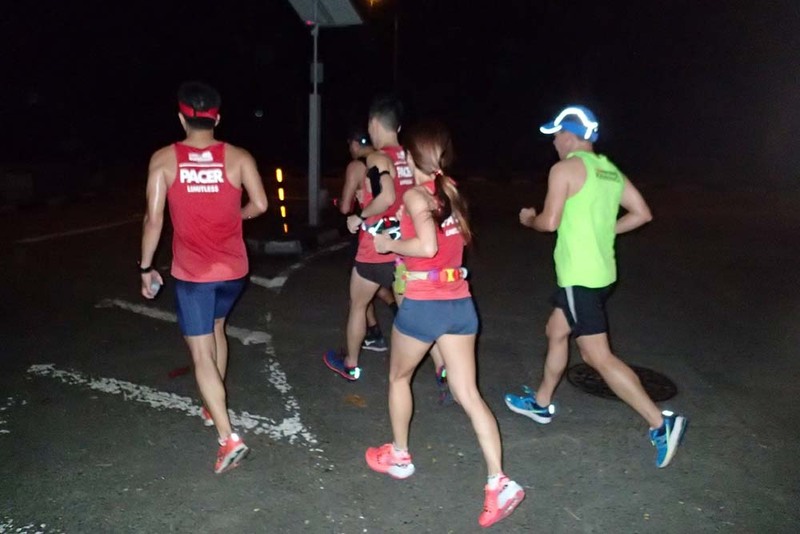 The Pacers and runners also took the opportunity to test out their race night apparel, hydration and fuel plans, as well as timing devices and race equipment to suss out potential issues to be resolved before the important race. 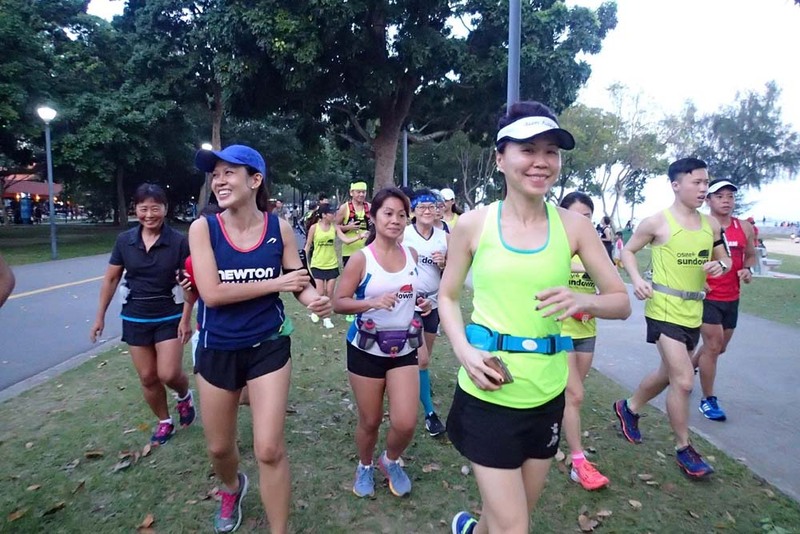 On the return, we ran a 5km stretch along the Marina 21km participants and it was great to see fellow NightHawks and FatBirds racing well in such nice weather. 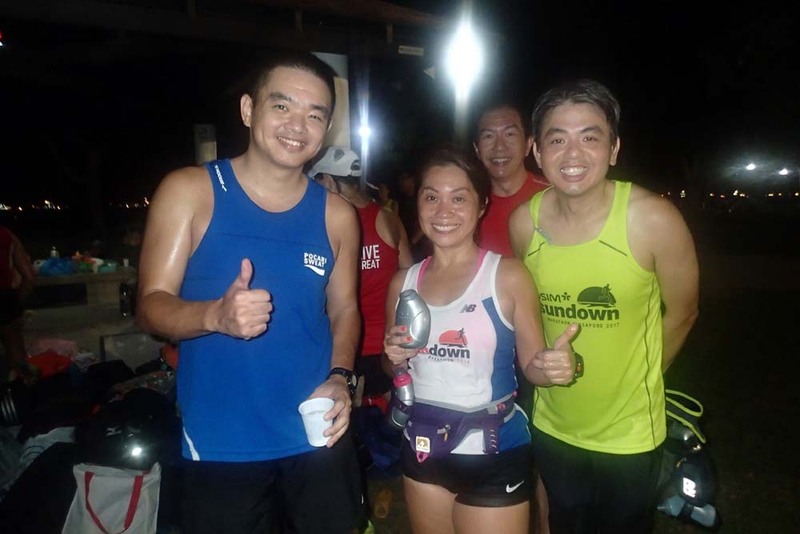 Our Sundown Pacer training ended very smoothly and on time at 9:45pm. 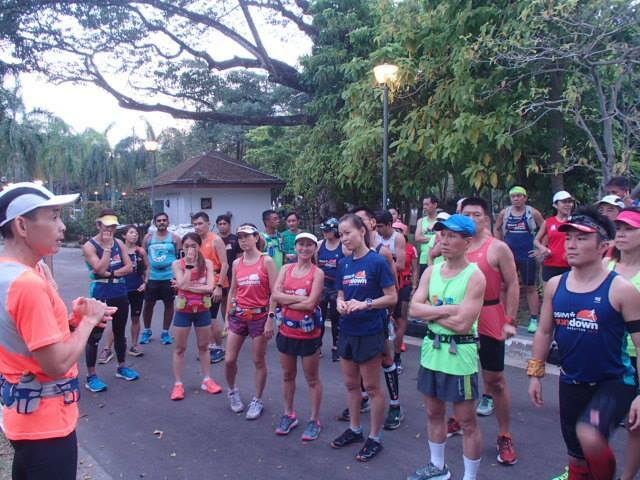 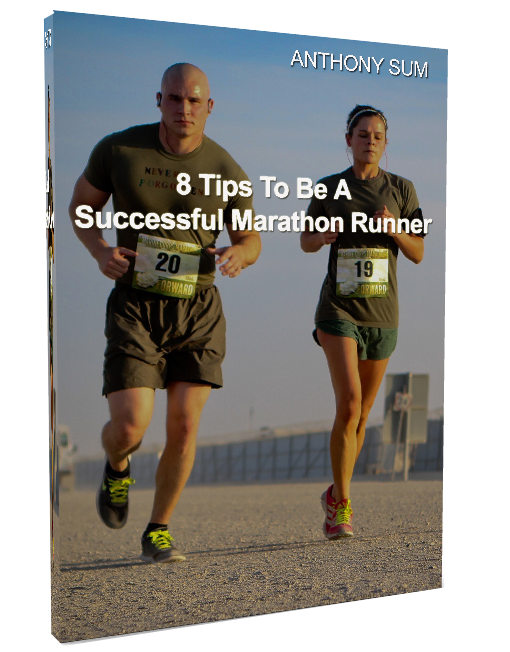 Along the way, we paced and brought back a number of runners who were there for the lead up run, and shared some tips and advice on how they can prepare better for their Sundown Marathon. 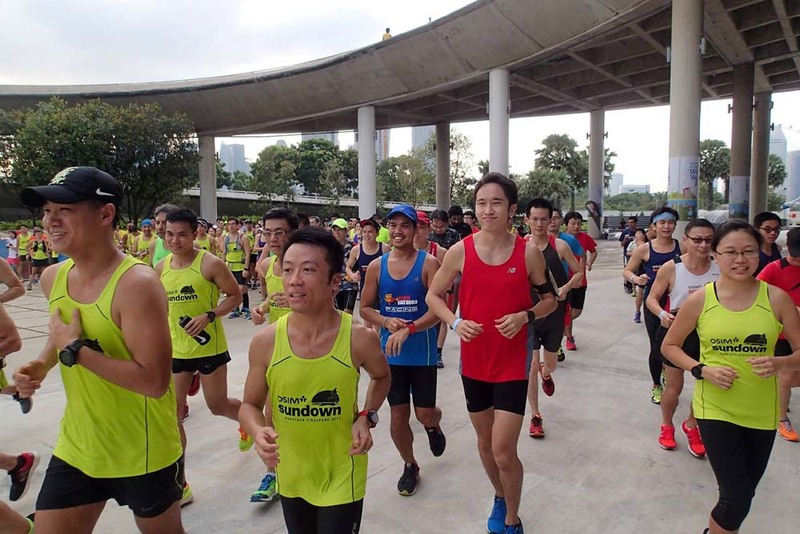 We look forward to the 3rd and final Sundown Marathon Lead Up Run on March 11 evening, and this time we hope for great weather and good attendance for all Sundown participants to get their final timed trial and test run in before race night. 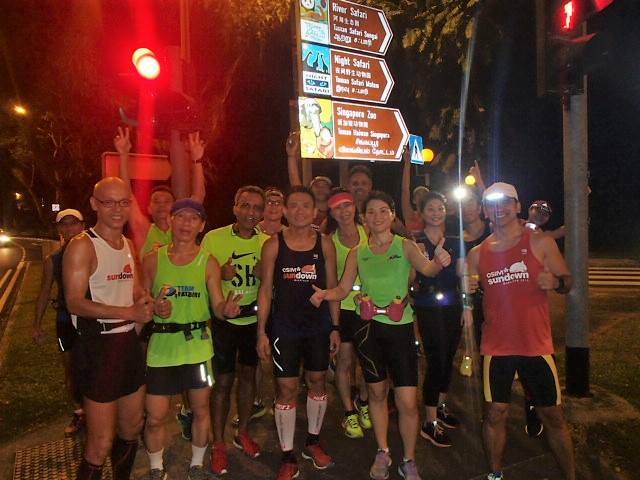 The Sundown Marathon Pacers Are On Track! 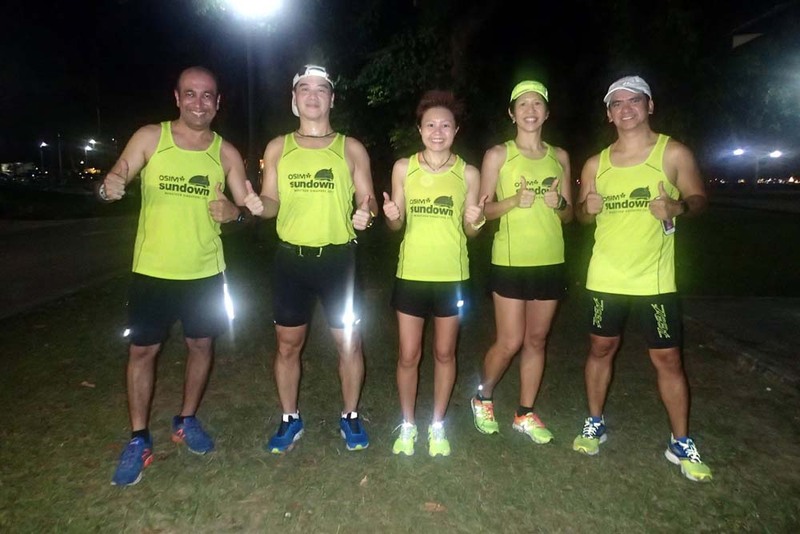 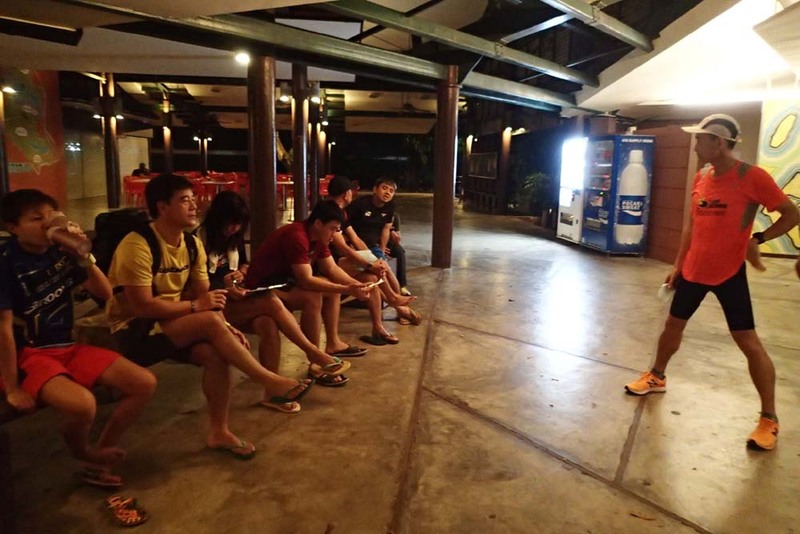 The NightHawks revisited MacRitchie Reservoir for their longest night run of 22km and 33km in Week #8 of the Sundown Marathon Training Program. 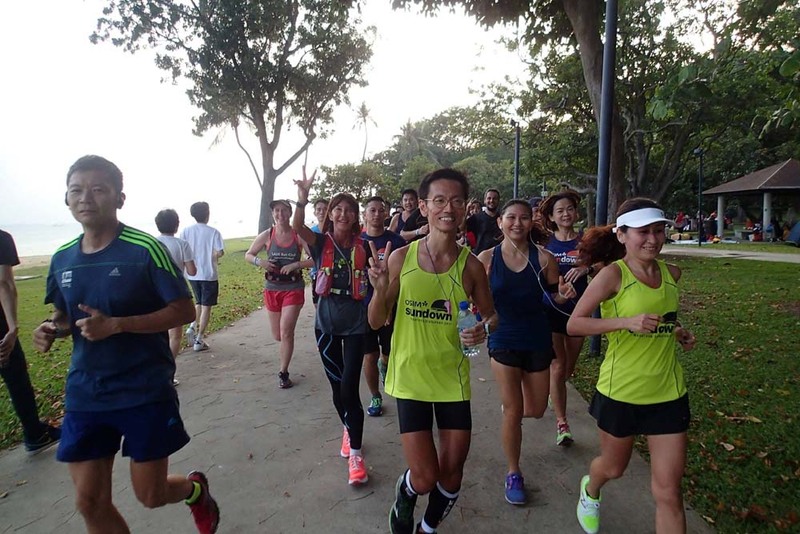 The weather was cool and slightly windy, great conditions for long distance training. 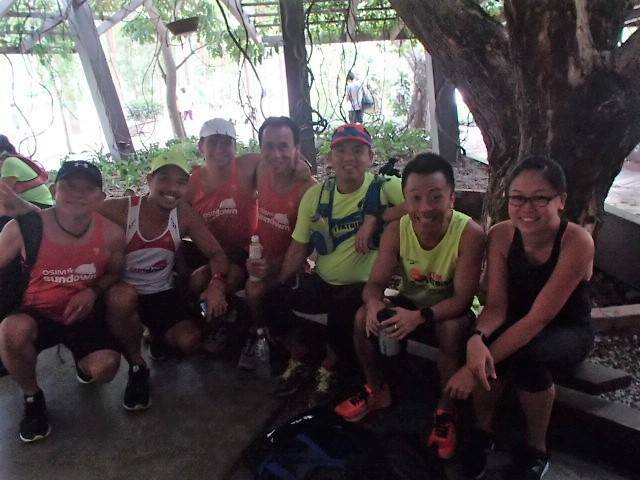 The route was meant to be challenging with its fair share of rolling slopes and undulating terrain. 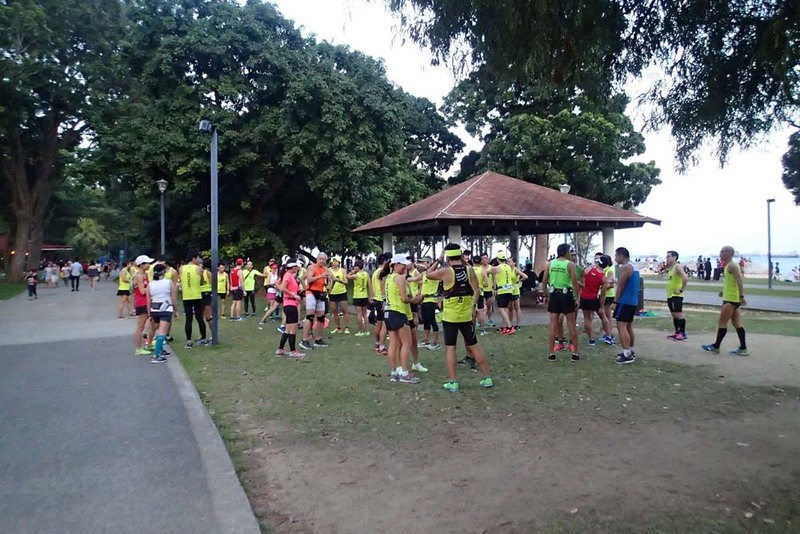 The NightHawk trainees and Pacers who just returned from their good performances at the Hong Kong and Taipei Marathons last weekend were tasked to do a recovery run instead of the full menu. 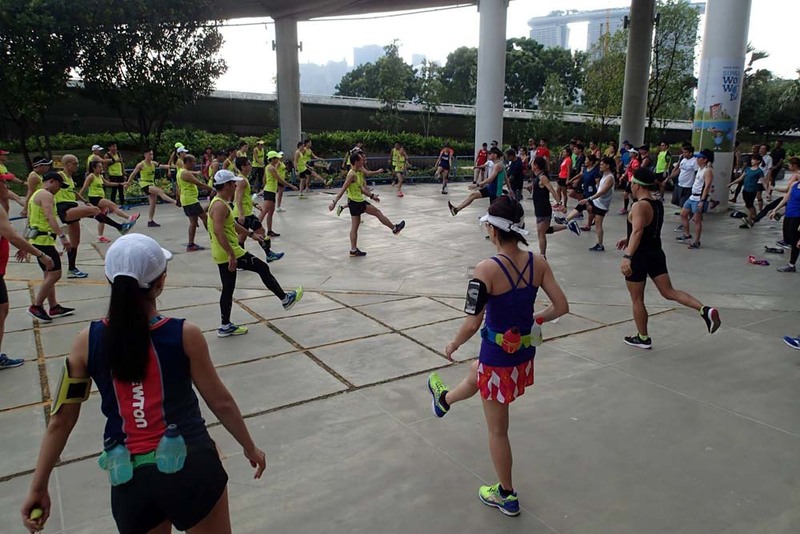 The respective pace groups, which by now are very familiar with the training objectives and requirements, went through their training with enthusiasm. 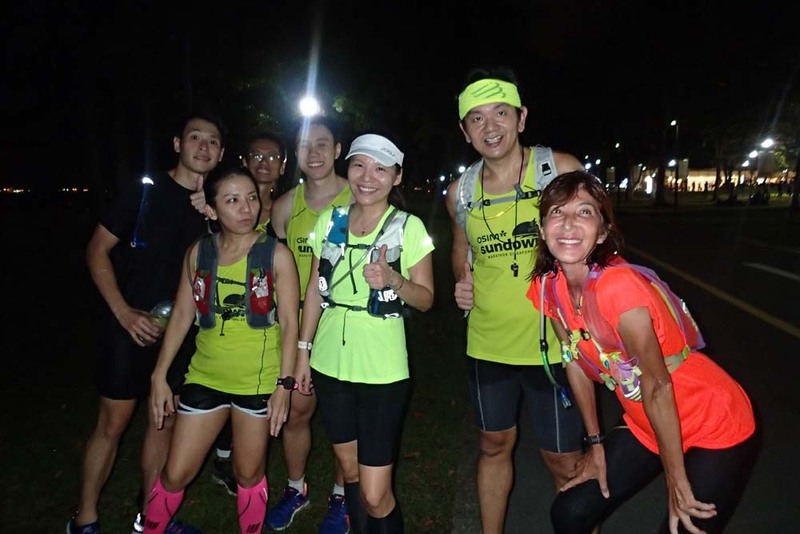 The quiet of the night coupled with the flanking forest vegetation along the run route made for an enchanting journey of sorts for the NightHawks. 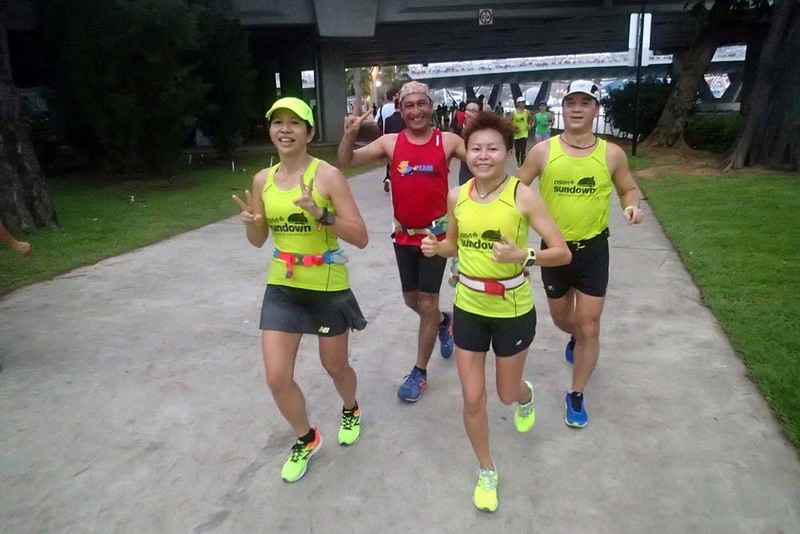 The Half Marathoners turned around the Yishun/Mandai Ave junction for a 22km @ Marathon Pace (MP). 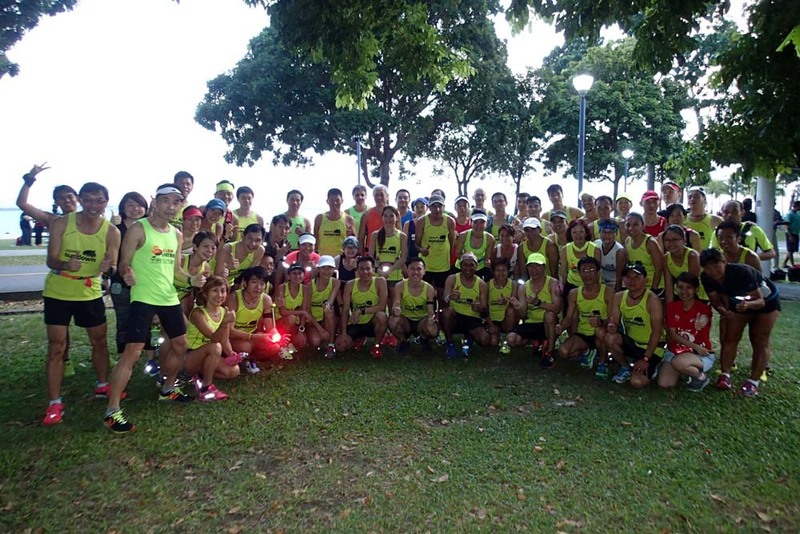 Many of them took the opportunity to test out their gels or fuel to help sustain MP for the return leg. 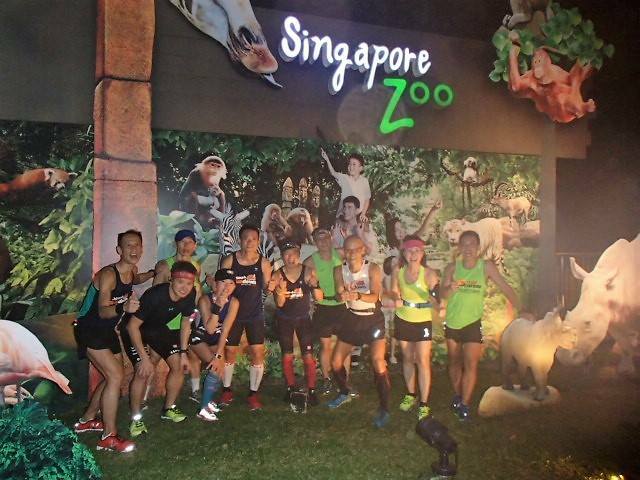 The Full Marathon groups went all the way to the Mandai Ave junction for a break at the Zoo Billboard – incidentally, it looked captivating and well lit after the refurbishing work done. 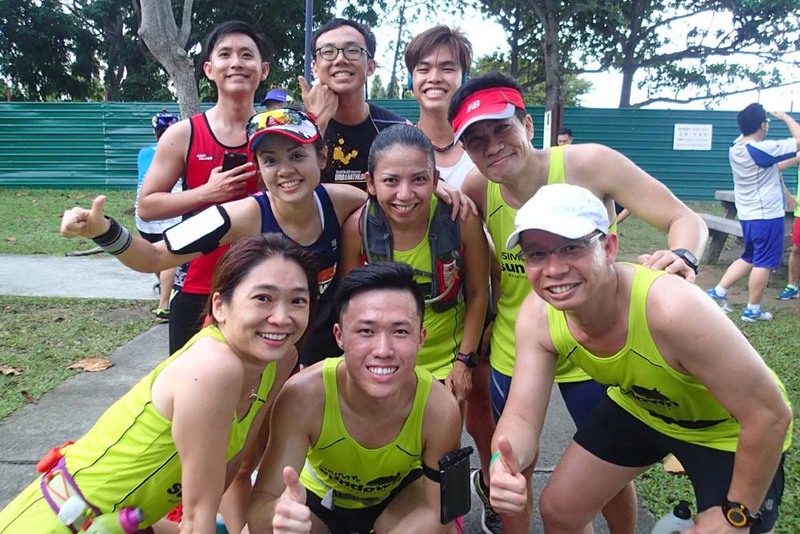 The runners also took the opportunity to pop in gels and fuel replenishment at the point, before making their way back for the challenging second half. 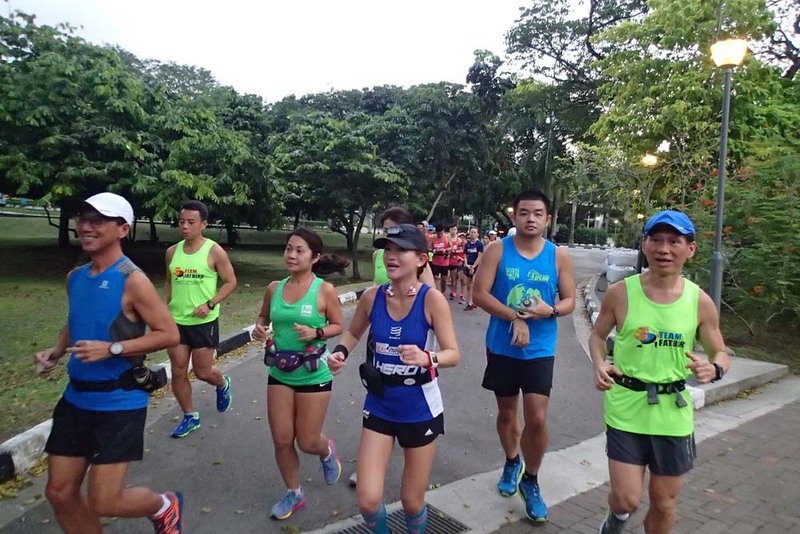 A few of the FM runners felt the strain at around the 25km mark when fuel and hydration resources ran low after 2-3 hours of sustained running. 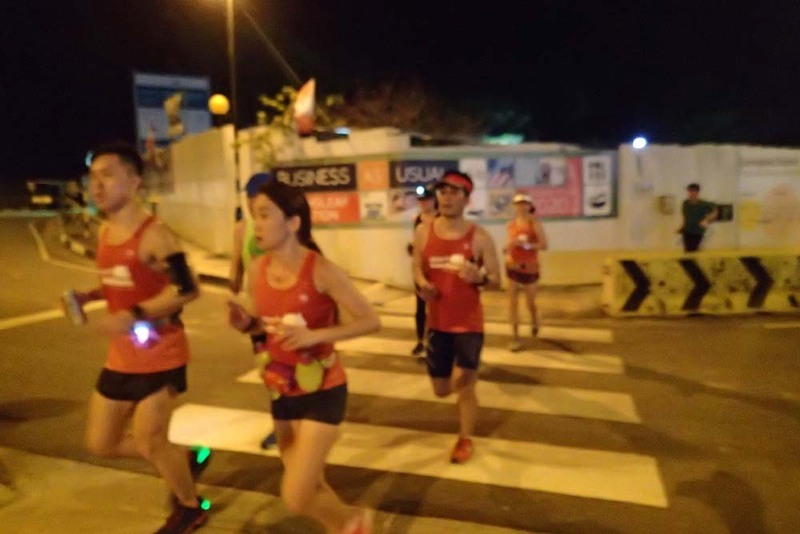 That was also the test of their endurance and ability to sustain the pace, with their legs probably screaming from the lactic acid build up. 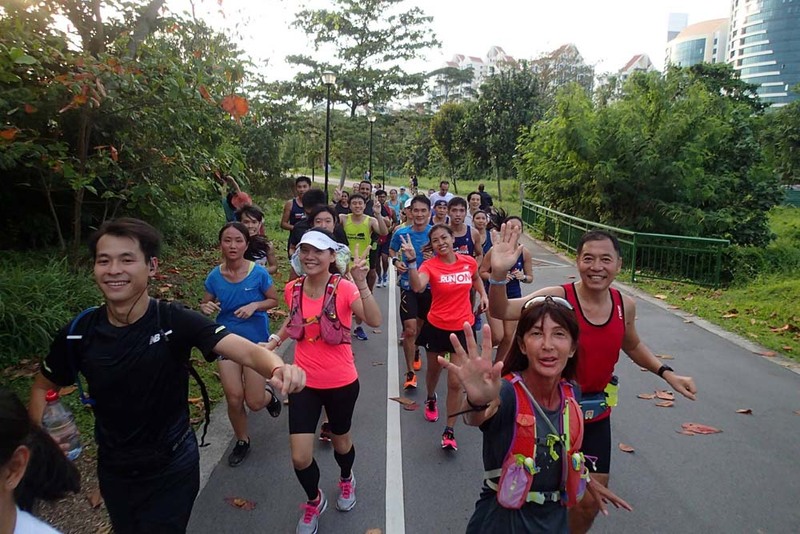 Breathing would also be more labored as the body is fatigued and trying to burn some fat, which require higher oxygen consumption. 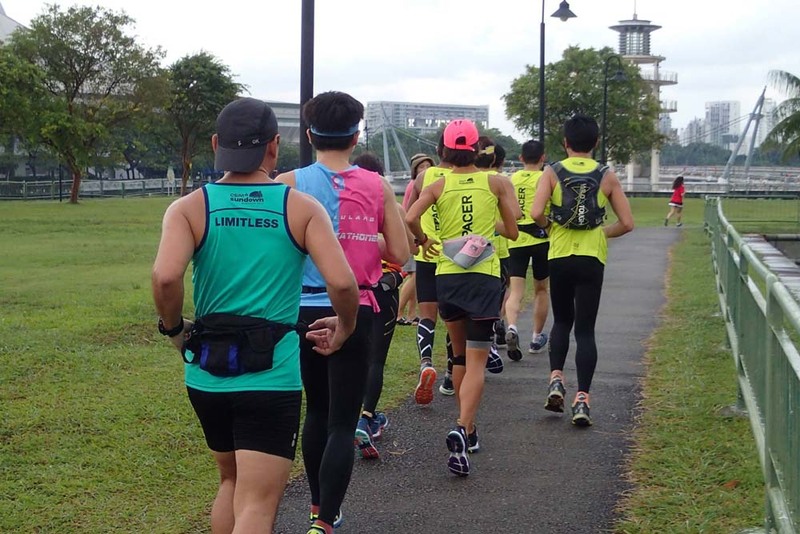 That is also the point when the tiring legs and poorer running form will cause a slow down in pace just for the body to catch up. 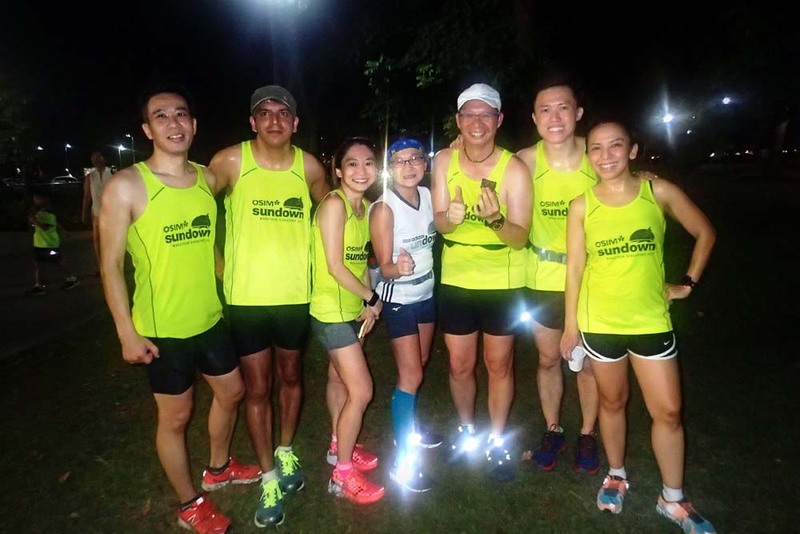 The HM and FM groups completed their tough training run within their targeted timing, and there were some good lessons that the trainees and pacers took away from the night’s training. 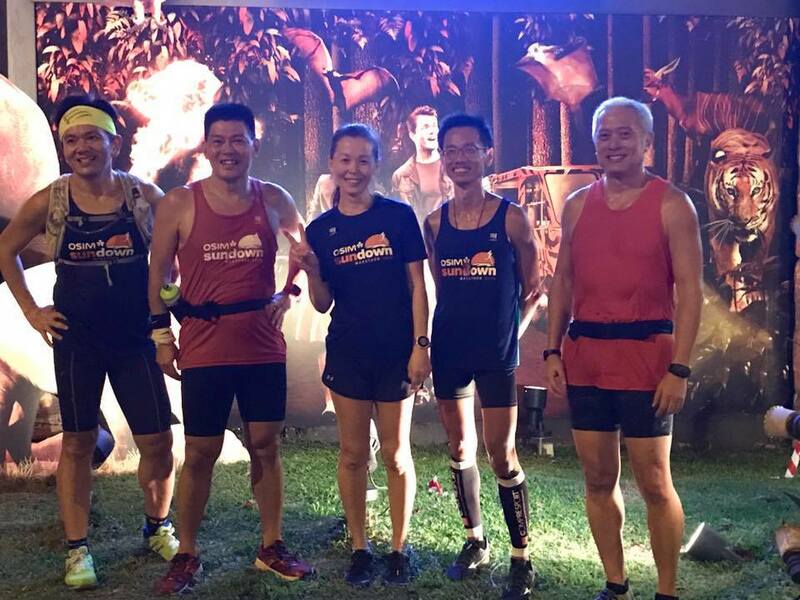 The satisfied faces on the NightHawk’s faces did not accurately reflect the challenging workout that they overcame successfully. 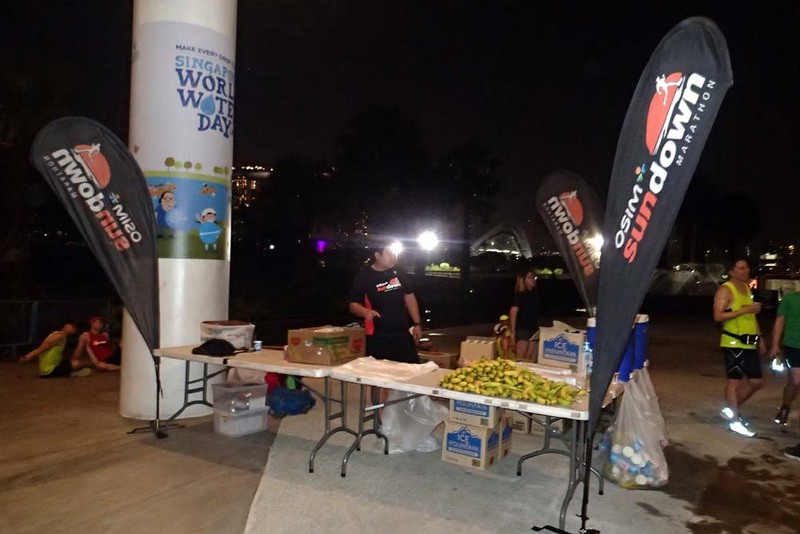 Bananas and isotonic drinks were consumed with gusto, thanks to the support team’s logistics who have been instrumental in providing post-run replenishment for the NightHawks all these weeks, most times at odd hours of the day or night. 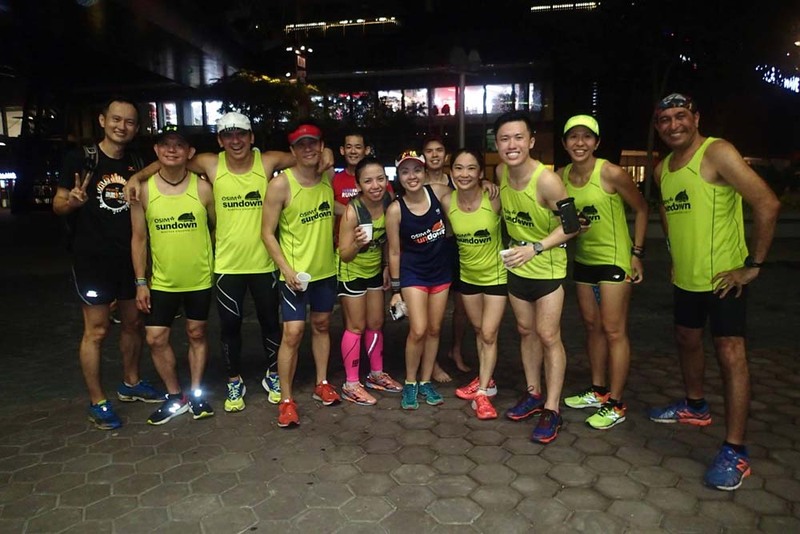 After a quick debrief and some tips on recovery from long runs, the NightHawks went in their separate ways, mostly in groups of 3-4, sharing tales and feelings of their longest night run to date.